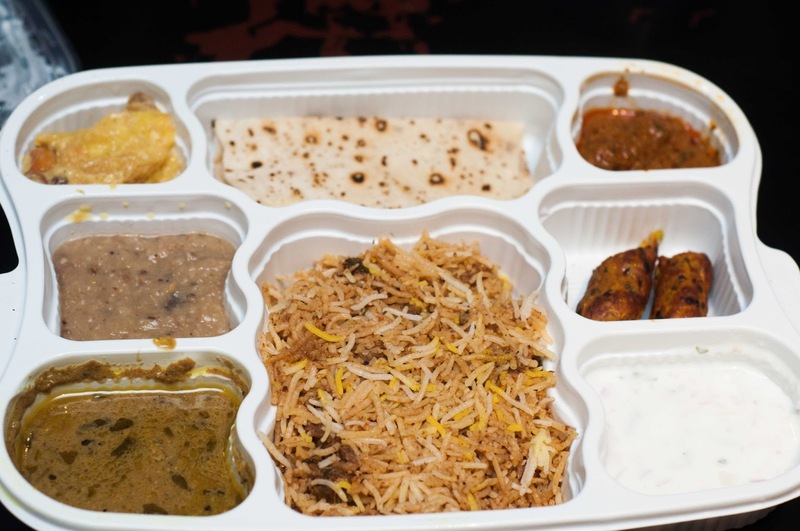 This Iftar has been a little disappointing as far as eating out is concerned and the trend continued at Charminar when my friend and me went there on Saturday. We were given a leaflet with two options - one buffet priced at Rs 399 and one combo priced at Rs. 249. We asked for the buffet and we were told that buffet was not there. So why then was it offered? So settled for the combo and waited. Asked for the sherbet and dates that was mentioned on the leaflet and the waiter (who had no clue what was happening), said that they were 'not doing very well 'this time' and so no sherbet and dates'. Whoa!!!! The combo came packed in a take away box with more than a dozen staples and together (yes, together), the waiter and us removed the staples one by one to reveal what you see. The haleem - teeny weeny bit and the less I say about it, the better. The biriyani, though, was quite flavourful and we both liked it. The kebab was so dry, I had a good mind to pour water to wet it. The chappati was super dry and super cold and we both started to wonder when this was made. At least for the guests eating in house, they could have heated it, but no! The sweet was excellent and so the two very good dishes, barely made up for the mess. For two FULL DAYS, this friend was rambling about me not taking him back to Blue Diamond and we could have finished Iftar for 200 bucks flat! Though I believe the price on the menu should reflect everything, at least the restaurant component like service charge, I normally don't complain too much about it. But adding 10% for not serving water, refusing to serve dates and sherbet and charging full price for the combo and not heating the food - you get the idea. I will stop rambling now! Good biriyani, but nothing more! I told the waiter, but he did not seem to care! Do you really want to know where this is? If I go back for biriyani, then I'll mention the address.